It should almost go without saying, the 1939 film The Wizard of Oz is an undisputed classic. Despite its age, the film attracts new fans every generation. It’s no surprise as to why the film remains so beloved. First and foremost, it’s a great story. Young Dorothy’s journey through the Land of Oz is a harrowing and spectacular adventure. It’s also not hard to relate to Dorothy as a character. She’s an orphan who lives with her aunt and uncle on their farm. Though they are loving people, Dorothy feels like something’s missing from her life. Her adventure through Oz represents the magic we all search for in our lives, especially when we get bogged down with the mundanity of everyday life. So, we root for Dorothy to find her way, not only back home, but in life in general. Did you ever spend much time wondering how the duplicitous wizard found his way to Oz? I know I didn’t, but we now have a film about how the mysterious wizard of Oz came to be. The 2013 box office hit Oz the Great and Powerful details the exploits of a traveling circus magician who became the most powerful man in Oz. The magician (James Franco) is also named Oz, and unlike Dorothy, he’s not sympathetic in any way. He’s actually a swindler, only interested in how much money he’ll make performing his mediocre magic shows. He treats his assistant Frank (Zach Braff) poorly and dismisses his would-be girlfriend Annie (Michelle Williams) because he doesn’t want to be tied down. Just like in the original, Oz is sucked up in a tornado and carried away to the mystical Land of Oz. There he meets Theodora (Mila Kunis), a witch who is a bit confused about her identity. The scenery in the Land of Oz is quite spectacular and fun to look at. There’s colorful plant life all around and some weird, little fish fairies that are kind of like cute piranha. It would all be pretty cool if the story wasn’t so boring. The pace drags along as Oz and Theodora make their way to Emerald City, where they meet up with Theodora’s sister Evanora (Rachel Weisz). Evanora wants Oz to go and kill the wicked witch Glinda (Michelle Williams). Now, if you know anything about the original you already know something’s not quite right, because Glinda is the good witch. So the suspense is a little lacking in that regard – we already know things are not exactly what they seem. Even as Oz embarks on his journey, things fail to take off. Along the way he meets a couple of unfortunate souls who want to tag along. 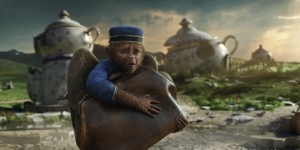 One is a flying monkey named Finley (Zach Braff, again) and the other is a china doll (Joey King). Oz reluctantly agrees to take his new acquaintances along as he searches for Glinda. I think one of the main problems with Oz the Great and Powerful is that Oz is not all that likeable. His only motivation is the promise of gold. In the original, Dorothy realized that she had spent so much time wondering what life away from the farm would be like, she lost sight of the things most important to her. All she wanted was to get back home to the family she loved. Oz, on the other hand, doesn’t learn anything about himself. All he wants is money and power. Those desires pretty much don’t change throughout the film. Since we know how the wizard ends up, we know we are not going to get some grand redemption. Yes, the wizard is ultimately a good guy who is capable of doing the right thing when it comes down to it, but that’s not all that exciting. The whole thing just left me wondering what the point of it all was. In the end I didn’t end up caring about any of it. 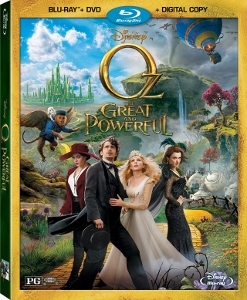 Oz the Great and Powerful is not anywhere near the same league as the Wizard of Oz. Any fan of the classic would do best to stick with that. For all the griping about the movie itself, nothing negative can be said about the Blu-ray. The 1080p, AVC-encoded transfer provides stunning visuals. The opening in Kansas is framed at 1.33:1, harkening back to the opening of the original Wizard of Oz. Peter Deming’s black-and-white cinematography is ultra-crisp. The framing opens up to 2.35:1 for the full color Land of Oz footage, which is when things really get dazzling. Colors pop, textures are realistic, and the entire image (the 2D version, Blu-ray 3D is also available) looks pretty much perfect. The DTS-HD Master Audio 7.1 soundtrack is equally great. The tornado sequence early in the film is one of the best places to experience the swirling, directional sound effects. However, all the action-oriented scenes sound spectacular, including Oz’s arrival as his hot air balloon careens down waterfalls. Disney has opted for what’s called a “near field” audio mix, meaning the soundtrack has been optimized for the acoustic properties of small rooms (i.e. residential living rooms). I guess that means folks with huge home theaters might suffer a bit, but the majority of people should be just fine. 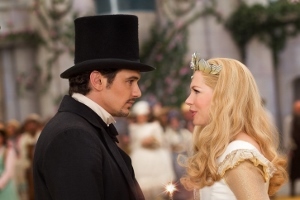 Oz the Great and Powerful comes equipped with a number of special features. Those with second generation or newer iPads can access extra material via Disney’s Second Screen. Of the on-disc features, we find seven featurettes. 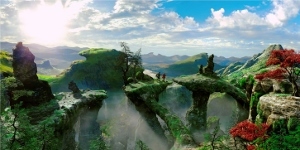 The most substantial is “My Journey in Oz,” directed by James Franco, which runs about 22 minutes. The other pieces total about 45 minutes and range in topic from special effects, to Tim Burton’s score, to a blooper reel. My kids enjoyed the movie more than me (maybe it was talking monkey), but it was entertaining. I did enjoy how beautiful Tim Burton made Oz.I would get the Blu-ray copy.